The 26th Hong Kong Film Awards were held at the Hong Kong Cultural Center on Sunday night. 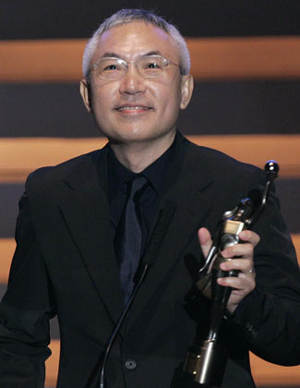 Fuzi, as known as After This Our Exile, collected five major awards including best picture and best director while Lau Ching Wan and Gong Li earned best actor and actress awards. After This Our Exile, which took home three Golden Horse Awards last November, won Best Film, Best Director, Best Screenplay, Best Supporting Actor, and Best New Performer at the award ceremony. Hong Kong actor Lau Ching Wan won the best actor award for his work in My Name Is Fame, and Gong Li took the best actress trophy for her thrilling performance in Curse of the Golden Flower, which also collected three technical awards. 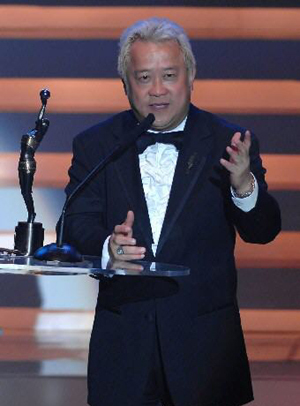 Lau Ching Wan started his film career in 1986 and while he was previously nominated 7 times by the Hong Kong Film Awards, this was his first win. The man burst into tears when he got on stage to accept his trophy amidst the audience clapping and cheering, a scene similar to Martin Scorsese's Oscar win in March. Best Supporting Actor went to ten-year-old Gouw Ian Iskandar for his performance in After This Our Exile, and best supporting actress went to Zhou Xun for The Banquet. Best Asian Movie went to a feature film Riding Alone for Thousands of Miles by Zhang Yimou, rather than the famed director's visual epic Curse of the Golden Flower, which faced a major backlash from Chinese audiences and film critics. The Hong Kong Film Awards have also set two new special awards this year -- the professional achievement award and the century achievement award -- which were respectively given to famous makeup artist Wen Runling and legendary Sir Run Run Shaw whose film company has produced over 1,000 films between 1925 and 1987. The Hong Kong Film Awards were founded in 1982 and have become one of the leading awards in the Hong Kong and Asian film industries. Actor Tony Leung Ka Fai (L) and Chinese actress Zhou Xun (R) present the Best Actor Award to actor Lau Ching Wan at the Hong Kong Film Awards Presentation Ceremony in Hong Kong April 15, 2007. 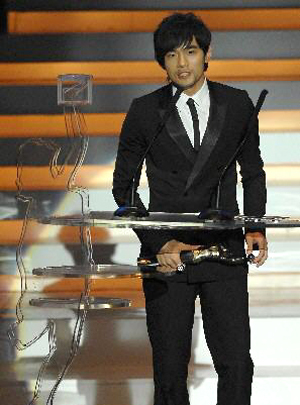 Lau won the award for his role in movie My Name Is Fame. Actress Zhou Xun holds the trophy after winning the Best Supporting Actress for the movie The Banquet during the Hong Kong Film Awards Presentation Ceremony in Hong Kong April 15, 2007. Actress Kelly Lin (L) and Chi Hsu (R) present the trophy to Malaysia-born actor Gouw Ian Iskandar as he won the Best Supporting Actor Award for the movie After This Our Exile during the Hong Kong Film Awards Presentation Ceremony in Hong Kong April 15, 2007. Hong Kong actor Eric Tsang gives a speech after the movie After This Our Exile was named best film during the Hong Kong Film Awards Presentation Ceremony in Hong Kong April 15, 2007. Taiwan singer Jay Chou gives a speech after his song Ju Hua Tai (Chrysanthemum Flower Bed) for the movie Curse of the Golden Flower was named best orignial during the Hong Kong Film Awards Presentation Ceremony in Hong Kong April 15, 2007. Director Patrick Tam Ka Ming holds the trophy of the Best Director Award for the movie After This Our Exile during the Hong Kong Film Awards Presentation Ceremony in Hong Kong April 15, 2007. (From L) Actors Andrew Lin, Terence Yin, Daniel Wu and Conroy Chan celebrate as Wu won the best new director award for his movie The Heavenly Kings during the Hong Kong Film Awards in Hong Kong April 15, 2007.